Gorillas grieve for their dead and have funerals for them just like humans, according to scientists. Their macabre rituals are the subject of a new study as experts worry their prodding and licking of corpses may spread diseases like Ebola. Humans were once considered unique in caring for the dead and having a concept of death. But a team of researchers observed groups of gorillas after three deaths and found they would gather around the bodies and groom them. 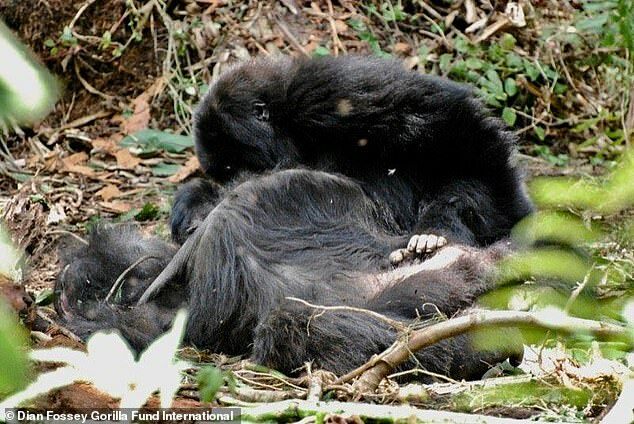 In one moving piece of footage, a young mountain gorilla was seen touching and and gently grooming the body of his mother in Volcanoes National Park, Rwanda. Researchers in Rwanda and Democratic Republic of Congo observed and filmed the behaviour of mountain gorillas around the corpses of Titus, a 35-year-old dominant adult male and Tuck, a 38-year-old dominant adult female living in Volcanoes National Park, Rwanda. The team also studied the behaviour of a group of Grauer’s gorillas who found a dead adult male not believed to be related to them in Kahuzi-Biega National Park, Democratic Republic of Congo. They predicted more gorillas would engage with the dead when they were from their own group, like in Rwanda, compared to the DRC gorillas who found a body of a gorilla not in their social group.